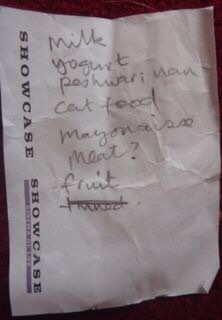 Kindly found and donated by Southampton Old Lady, this list is kind of normal apart from the Peshwari Nan. This is a sweetened grandma who is the perfect compliment to any spicy Indian meal. LOL! I want some of that sweetened grandma! meat? perhaps seeing the prices of meat to make curry or give to the cat! Tinned crossed out as on second thoughts fresh fruit was better? Recently been to the new Showcase Cinema too.